(MP194). Watercolour signed and dated 2010 (LR). 10.5 x 6 ins (26.7 x 15 cms) approx. The last surviving CVS of the RN's fleet once ARK ROYAL had been paid off prematurely by a hopelessly short-sighted goverment in 2010, ILLUSTRIOUS too has now gone. 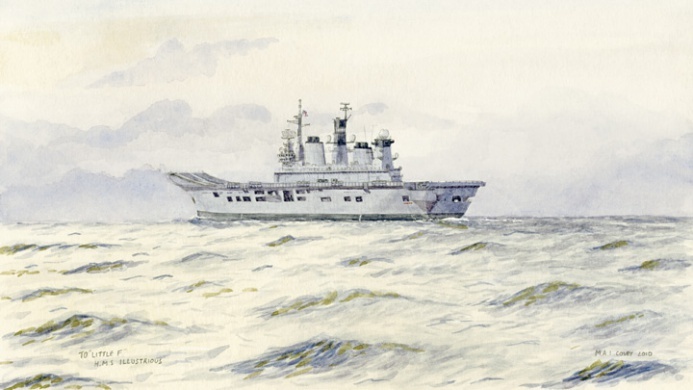 This watercolour was painted by Max Cosby as a thank you present to Little F, Lt Cdr Johnnie Barnes-Yallowly, for inviting him onboard for some sea time in 2008.